When it comes to monitor resolutions, there are really two monikers that are being thrown around today — 1080p and 4K. While 1080p screens look good for monitors that are smaller than 27″, 4K tends to be what is recommended by the local Best Buy salesperson if you want a high resolution screen that is 27″ or larger. I can’t explain exactly why, but if I were to take a guess, I’d say it’s because the marketing hype is all about 4K or they don’t know any better. Dang marketing schemes. If you’re looking to buy a monitor, I’d throw another option at you: 1440p. 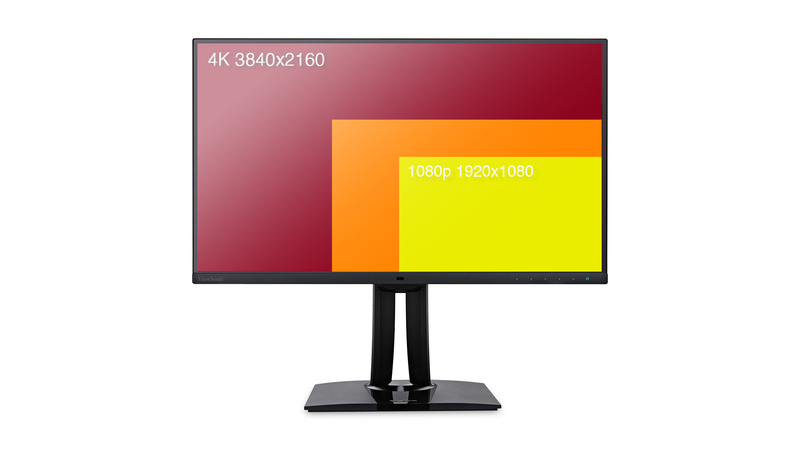 Perhaps you’ve heard of it as QHD, Quad HD, WQHD, Wide Quad HD or even 2K, which are all synonymous references to the amount of pixels that the monitor will display, otherwise known as resolution, (2560×1440) which is around 3.2 million. That’s four times more than Full HD or 1080p. There are a million articles specifically on resolution, but if you want to know why you shouldn’t choose 1080p or 4k and why you should choose 1440p, read on. 4K on a 27″ screen is overkill for most people out there. Causes more stress on video cards to produce what is on your screen — can lead to a large drop in performance. Typically requires a higher end video card if you want multiple monitors. If not, you’ll have stuttering graphics visible when scrolling or zooming in and zooming out. In short, it’ll slow things down. Windows and certain applications are hit and miss with support for 4K displays. If you don’t scale your screen (adjusting apps, text, and other items), everything will be super tiny. If you scale your screen, you’ve already lost one of the perks of having a larger resolution display — the ability to have more screen space to hold more application windows. Lower resolution images and such will not look as good when blown up to a decent viewing size. Seriously though, right now, 4K seems to be the standard for TVs, but not all of the content is even streamed in 4K. If you’ve ever seen the normal 1080p TV streams upscaled onto a 4K TV, you’ll understand. Built for specific audiences — gaming or productivity — so there is attention to detail to key features like high refresh rates, viewing angles, or color accuracy. Size matters, I know, but why 27″? As a photographer, you’ll want to see the detail of the images you take on a screen that isn’t super tiny or needlessly large. Smaller monitors will have better pixel density or more pixels per square inch, compared to a monitor that has the same resolution but has a larger screen. In my experience, 27″ is the sweet spot on cost, space, and ease of viewing. If you don’t have the space for a 27″, then 24″ would also do well at 1440p. If your monitor is further than 3 feet away from you, then maybe a 32″ would work for you, but because 32″ screens tend to be a bit more expensive, I’d rather position a 27″ monitor a bit closer and get the same effect. Doing video? You may want to go with something larger, from what I’ve heard, having a nice ultra wide monitor is pretty awesome when it comes to editing timelines and such — in which case, you wouldn’t get a 4K screen or even a 1440p screen, you’d do one of those crazy WQHD+ 3840×1600 screens in my opinion. 1080p screens have the cheapest price tag. Cheap doesn’t always translate to what you need, but instead, what your wallet needs. There’s a plethora of enticing 27″ 1080p screens for anywhere between $100-$170. But know better! Those cheap screens are a pretty good deal if you’re in a pinch and need a monitor that works to play games uncompetitively or just surf the web and do finances, but you’ll want to spend a little bit more if you’re playing with pixels. 1080p screens at 27″ require the pixels to be larger to cover the area of the screen. There is a stat for that called pixels per inch (PPI) that companies often boast. The higher the PPI, the smaller the pixels, and in return, the sharper the image. 1080p screens roughly have 82PPI at 27″ compared to 1440p screens at 108PPI, resulting in a pretty modest amount of smoothness over the prior. 4K screens have 163PPI at 27″, which is quite impressive, but will make the text super small and requires scaling to be pretty usable. The best medium between the two is 1440p. It’ll provide enough ‘real estate’ for multiple windows, allow for more viewing area for the photos without a heck of a lot of upscaling, won’t be taxing on your video cards and will still allow for multiple monitor setups for laptops (via Thunderbolt 2 or 3). I use an iMac 27″ (late 2012) which is 2560×1440, and it’s been performing great for six years now. My main tools are Lightroom and Photoshop, aside from the regular internet and office tools. As the operating systems advance and become more demanding for processing, the upgrade to 4K or higher becomes inevitable. As for real estate size, I agree that 27″ seem to be comfortable, without too much eye-panning across the display. Right?! Isn’t it amazing that a Mac from 6/7 years ago can still last and work today? I love it. Oh, and I totally believe that 4K will one day become the standard, I believe that that day won’t be for a while though. I just checked out a law office out here in Vegas, and they’re still running 1024×768 4:3 monitors– totally blew my mind, but they still work and it seems to not hinder them. I tried a 38″ TV as a monitor just for kicks– eye-panning across that screen was nothing but ridiculous. Thanks for reading! I had been using a 32″ Samsung 2560×1440 monitor as my main monitor along with a 24″ 1080p secondary monitor, using them in an extended display configuration. I recently purchased an LG 32″ 3840×2160 monitor on sale at Costco and made it my primary, and the Samsung secondary, selling the 24″. I wish I had seen this article earlier. In order to read the text on the screen, I have had to scale the LG monitor to 175%. It also turns out that Windows 10 does not handle scaling consistently across multiple monitors of differing resolutions. Some applications can be moved at roughly equal size to the second screen (they sort of auto scale), while others double in size and must be rescaled. There was nothing wrong with the Samsung resolution for photo editing and other work, but the 1080p monitor was not quite up to snuff. Herschel! Thanks for reading! Costco does have a pretty good return policy– might be worth looking into! Scaling– is that the absolute WORST?! C’mon Microsoft– it’s already bad with one monitor, I know it’s even worse with multiple!